2, you provide a picture or design artwork: we can mold proofing in accordance with your requirements (mold, proofing costs may contact online business assistance), quotes, samples, samples, visit, signing contracts, arrangements for production. 3, note: due to different factories and shops, cannot stock we basically do not have the cash, you need to order, before mass production, to cause you any inconvenience, please forgive me! this company product mainly in the metal products, plastic products, due to the purchase area near differ, therefore, when you order a product, first get in touch with us, contact the shipping method, the shipping company you need to wait, according to the actual shipping charge. 1. General customer enquiry, please provide detailed product information, such as pictures, size, quantity, packaging requirements, and so on, In order to offer us the most accurately most reasonable price, if you can provide samples for more complex products better. Due to the various styles, some products may not be similar products of our factory, as long as customers provide detailed information or sample, we can make exactly the same product. (Specific contact business staff. for a long time, due to the perennial plant to provide customers samples, resulting in greatly increased production costs, so our new policy rules, without prior cooperation between the client, to receive a certain amount of proofing. Want customers to understand. Proofing time generally 5-7 day. customers paid proofing costs without sending samples of courier charges. fast same day shipping (spot), custom-made product delivery depends on order quantity, factory production cycle to determine the specific contact business staff. 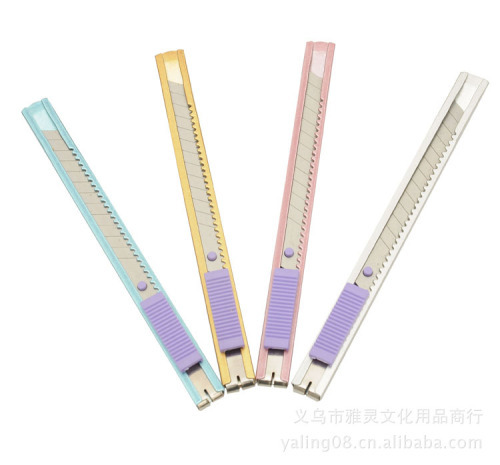 Our factory established in 96, mainly the production of "Ya-ling" brand high middle and low Pencil Sharpener, pencil sharpeners, scissors, utility knife, in order to ensure product quality as the first, in a similar industry to gain a good reputation in the market! Product quality assurance, reasonable prices, welcome and trust by the broad masses of old and new customers, products are exported to all over the world. And with many domestic companies of foreign trade enterprises have maintained long-term cooperation partnership! according to different customer groups, according to the customer's requirements, client proofing produced the first time! 2012, I company determines future target market, outputs high quality of products, I company products than of is price, and service and speed; company always insisted adhering to "products specialization, and operating internationalization, and management scientific" of development concept, building perfect of domestic abroad marketing network, relies on Yiwu globalization of market sales platform, played "grew up do fine, and from fine do big" of enterprise spirit, do strong big. The road of development, and we look forward to working with you hand in hand to create a better tomorrow!